It’s faster AND cheaper for Dave to have a courier deliver a package vs go pick it up. This shows the system effect of lots of packages being delivered. SpaceX just announced their white paper and intent to work on the HyperLoop, a high speed train from SF to LA. There will be a mini Maker Faire coming to Sydney! Dave will be making something for it, anyone who guesses gets a free t-shirt. Dave has been hacking and capturing IR signals for his new segment. People are never happy with how you do projects online. Especially if there’s code. Dave has been putting code up onto GitHub Gist. This is separate from the main GitHub site and is similar to Pastebin. Chris will be joining them for the second session of the work on this board, Wednesday night. You’ll be able to watch live on their blog page about it. What do you think about our advertising? Fill out the survey at the bottom of this post! More services are allowing forking and sharing of revenues. OSHpark now has a marketplace for existing designs. Tindie is doing revenue sharing. Shonky Product of the Week: a USB Soldering Iron. Heat capacity is still a thing, right? There’s a teardown of this unit by Connor Wolf showing how it’s put together. They also say you can use 9V batteries. This is limited by the internal electronics resistance (which is usually the spec’d value) but also the ionic resistance, which limits the current due to the speed of the chemical reactions. Intel is jumping into the open hardware space with the Minnow Board. Their add-on boards are called “lures”. Dave thinks you should just buy a mini-ATX board but Chris thinks there’s value in having access to this kind of tech from Intel. You can see a lot of the different boards out there at the Big Board List. Development platforms are nothing new. PC/104 (which utilized the ISA Bus) has been pluggable and around since the 80s. Chris likes the Freescale tower platform, which is similarly stackable. The thing that makes a difference is the software layer (like the Arduino IDE) and the community (which is why open source helps!). Opening up designs is even older! There were standardized interfaces on the Altair 8800 and the IBM360. These really helped fuel the computing boom. HackRF is a new kickstarter project to get you started with SDR. It was laid out in KiCAD! If you’re laying out boards and need to work on panels you can do MouseBites or Vscores to get your boards free of the panel. If you’re starting at a new company, you’ll be subject to documentation tribal knowledge. Just flow with it, at least at first. There are printable electronics at PARC (and a few other fun things). Dave still gets upset about it not being a chip printer, but we can all agree he’s wrong on this one, right guys? Tune in next week when we post the interview with Eric Ries, author of The Lean Startup! 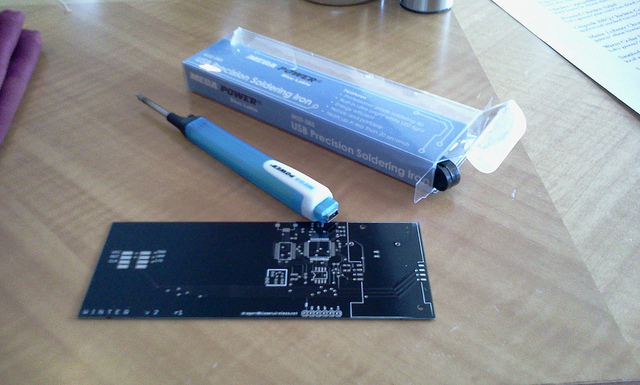 when is my wifi powered soldering iron coming? or even better, a free energy perpetual thermodynamic defying powered one! The embarrassing thing about the USB soldering iron is it’s sold by Element 14/Farnell. Shonky company of the week?